I try to use my blog as a tool to tell the world about things I perceive as wrong. 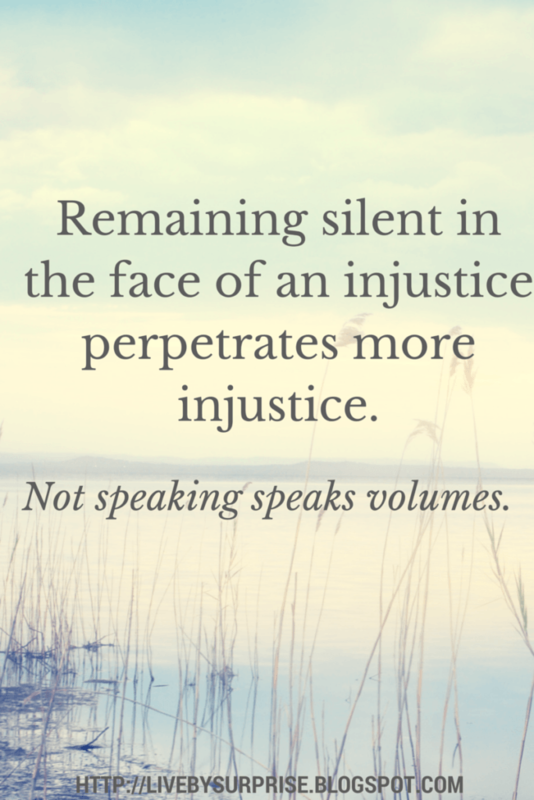 I feel that remaining silent in the face of injustice perpetrates the injustice. Not speaking speaks volumes. But not the right message. Today – I want to give you the right message. I came across an article in my Twitter feed that disturbed me. This article from a Canadian paper describes a man who was disciplined by his regulatory body for sexually assaulting thirteen of his female patients. It appears that none of the patients have made a criminal complaint, but neither has the regulatory body. Police say their hands are tied unless someone lodges a specific complaint (including names). Although I have to question why the police can’t get access to the records if they know a crime has taken place, that’s not the point. The regulatory body has allowed this man (I refuse to call him a doctor – because real doctors take seriously their oath to “do no harm”) to continue practicing medicine. As long as it’s on male patients only. Yes. Male patients only. He returned to work at a Mississauga, Canada clinic in July after an eight month suspension. The only limitation the regulatory body imposed is that he must clearly post a visible sign in his waiting room saying he can treat men only. The article isn’t clear, but given he’s been practicing for several months, I suspect that the regulatory body didn’t provide any other notification to the community. Protecting the man was more important. risk of re-offending. During the inquiry, the man failed to take responsibility for his actions. He did not display any insight into his behavior. People are supposed to be able to trust their doctors. They’re supposed to be the people you can go to with all sorts of personal and difficult problems. Their in a position of trust. You should be able to be at your most vulnerable with them. But that vulnerability can make you a potential victim. As it did to the women in this case. The committee could have revoked his license. They could have made him an example. They could have taken a stand against sexual abuse against women. Instead, they used a “loophole” to suspend him and give him a conditional license. If he treats men only. As a woman, I am absolutely appalled. The fact that (if I lived in Canada) this man might treat my husband or my sons makes my skin crawl. He’s admitted he did it. The complaint was from only one victim. He admitted there were ten to twelve more. Who knows how many he didn’t “remember” or admit to? Who knows how vulnerable the other women were – and whether or not they even remember the attacks? Were they even notified? Were they given the chance to speak? The man in this case has shown no remorse. He’s given no indication that he understands what he did was wrong.It’s outcomes like this that make women less likely to report. Afraid that they’ll get blamed, or shamed. And it ends up perpetrating a cycle of silence. People who don’t speak because they’re afraid to. And more who cover it up in the name of protecting the perpetrator. I’m not afraid to. I’m speaking. Are you listening? regulatory body in my state would have suspended the man immediately. And after a fair hearing, not limited but revoked his license. And put a black mark on his reputation in case he wanted to practice anywhere else. Or ever be put in a position of trust again. their patients are more important. Next time, the patient who is assaulted could be their daughter, their mother, their sister. and sanctioned it by their actions do not learn from this – I fear for all of our futures. I will not remain silent to this transgression. I implore you – please use your voices too. Speak out. Don’t allow this to happen again. Because next time it could be you or someone you love. We are all victims of this man. But even more so – we are all victims of the process that allowed his actions. We don’t have to be. All you need is your voice. Speak up. Update (May 2015) – I understand that this doctor’s license to practice has been revoked and he is no longer practicing medicine.